I bought this mower as I am waiting for my petrol mower to be fixed, and thought that it would be handy to have something ever so slightly more reliable than my 20 year old Hayter, which breaks spectacularly every spring without fail. And what a world of difference. I think I will actually sell the petrol mower, as I now have no use for it. 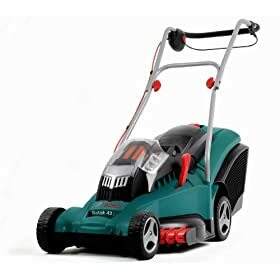 1) It comes with two batteries, which I didn’t really appreciate, so one can mow continuously (unless you have a very rough lawn which will use the battery up faster than it can be charged). 2) It has a cool comb thingy which cuts right to the edge of the grass. It really works. 3) Its pretty quiet, so you can cut in less sociable hours. 4) It probably won’t break or need servicing routinely. This should save one a lot of money. Disadvantages? It can’t get through really tough grass as well as a petrol, you would need to mow it from a height first then again at a lower one. I suppose you don’t look as masculine as a petrol mower user. It also feels a bit ‘light’ and platicy. But I think it will actually wear quite well, its quite well constructed despite the materials used. Hopefully it should last quite a while. All in all a product which is hard to fault. Purchased this machine to be cable free & with a view to my partner being able to use, we were reluctant to purchase petrol as these can be a bit tricky to get started occasionally. Anyway we have been delighted with this machine, battery life is good even when the grass is left to be longer than ideal. It is very easy to use & it is fantastic to just walk out the garage pull the lever & cut without having to top up with fuel or run out miles of cable. The quality of cut is great & the stripes are the longest lasting I have ever encountered with any mower, although this may be due to the lawn grass. All in all I would recommend this mower to anyone. The only point I can’t comment on to date is battery life but Bosch say we should get up to 1,000 charges which at 30-40 cuts/year is more than enough for anyone.